Breakaway is played on a 27-by-54 foot carpeted field with two "bumps" separating the field into three zones. Breakaway involves two alliances of three robots each, trying to score soccer balls into either of their two goals. 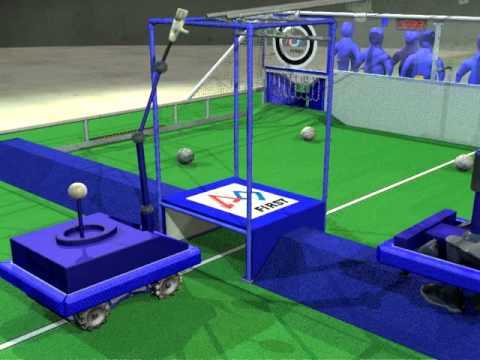 The robots are designed to kick a ball or try to defend the other alliance's goals to prevent the opposing alliance from scoring. During the last 20 seconds of the match the robots try to hang off the tower or their alliance partner’s robots to gain bonus points. Drive: Encoders on each side of the drivetrain used to calculate information such as distance travelled and velocity. Gyro used to keep track of angle. Team 1114, Simbotics entered the 2010 season hoping to build on their performance from 2009. Swept up by an Olympic year, Simbotics Chairman's Award theme and robot name (Simbot Quatchi) both displayed the enthusiasm Canada showed for the games. The team was able to capture its fourth Regional Chairman’s Award in team history. A very successful regional season earned them Regional Champion Banners at the Pittsburgh, Greater Toronto and Waterloo regionals; marking the third time in Simbotics history that three regional wins were captured in a single season. At the regional events, an additional seven awards were captured including, among others, an Industrial Design Award at the Greater Toronto Regional. The team entered the World Championships in Atlanta, Georgia with high expectations and were placed in a strong Curie Division. Simbotics seeded first in qualification rounds and along with Las Guerrillas (Team 469) and The Robocats (Team 2041) managed to capture a Curie Division title and make it to the Einstein Field. Unfortunately, after two tough matches, the alliance was knocked off by a strong Newton alliance and Simbotics left with World Finalist honours. Chairman's Presenters: Craig R., Stacey W.